While growing up I had many many caged pets. 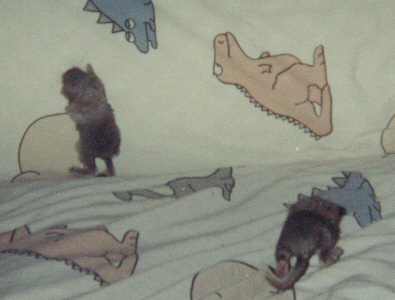 Mostly rodents, but I did sometimes bring home a fish. 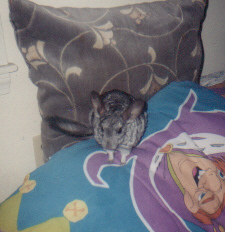 Some of my favorite pets were my chinchillas, I still love them even though I don't have any pets today. 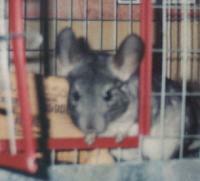 Chinchillas come from the Andes mountains of Peru, Bolivia, Argentina,and Chile. These nocturnal herbivores originally lived at high altitudes and developed a thick fine fur that allowed them to keep warm. Their skin and fur are kept clean by taking "baths" in dust, as the mountain climate would be too cold for them to clean themselves with water. In the late 19th century and early 20th century these animals were prized for their fur, and mass-trapping nearly lead to their extinction. 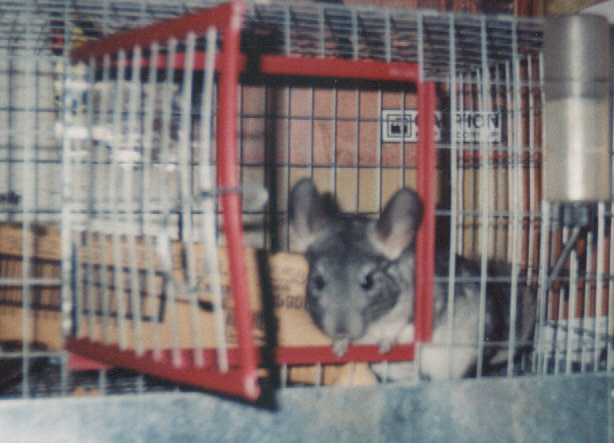 In 1923, in an effort to preserve the chinchillas for the fur industry, a man named Mathias F. Chapman caught 11 wild chinchillas and had them shipped to the United States. It is believed that these 11 animals built the foundation on which all the captive chinchillas are now descended from. 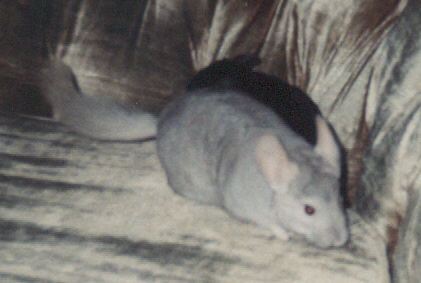 While the fur industry is not as widespread as it was in the early 20th century, chinchillas are still bred for their furs (sometimes taking over 100 for a single coat!). There are hundreds of small breeders across the country who only breed the animals for pets however. As pets, they are quiet, don't have much of an odor if properly cared for, and are very energetic and curious. They live for up to 20 years in captivity, so owning one is a similar time responsibility as owning a cat. 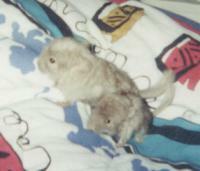 They do love attention, and I've found that mine tended to hold grudges if I didn't take them out to play often enough. They love to play on stairs, and some of mine even enjoyed sometimes playing in a little bit of shallow water or snow. They cannot be litter trained, but are usually good about short trips out of their cages if they are used to it, their "messes" are easy to simply vacuum up if they are being fed and cared for properly. 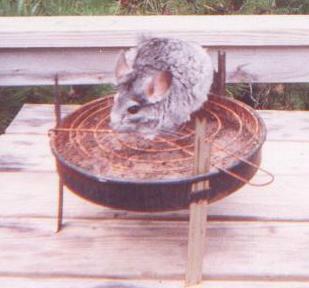 Chinchillas generally grow to be the size of a dwarf rabbit. Some people have described their tails like squirrel tails, even though they are not quite as bushy, and the long fur points upward (not fluffy all around). They have big "mouse like" ears. They come in a variety of colors, pictured above are "standard (or grey)" "beige" and "ebony." There are also black velvet, brown velvet, white, violet, and several variations on these. 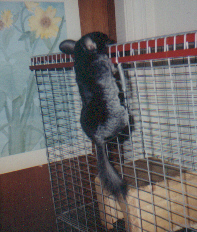 The price for chinchillas varies greatly, I've spent between $75 and $200 for each of mine that I bought. I have also "rescued" a few who were in homes that no longer wanted them. 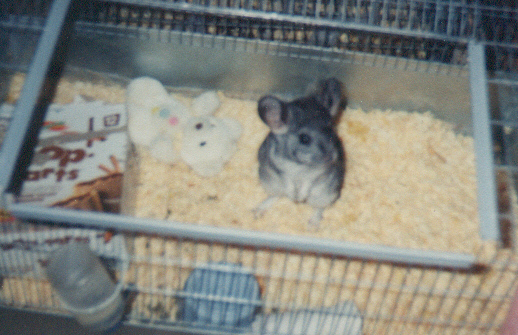 I got my first chinchilla in December of 1994. Her name was Eve, and she was born on September 25 of that same year. It was around Christmas that I was able to bring her home from the pet store. I played with her more often than I could most of my other pets and always loved to cuddle. We quickly learned that she was afraid of the dark and I went out and bought a night-light for her. Every Christmas and on her birthday we would give her a present that she would enjoy chewing on. I gave her a stuffed toucan once, and she kept it in her box to play with and sleep on, even after she had pulled most of it's stuffing out and chewed on it. She was a wonderful little pet. Unfortunately, although chinchillas rarely get sick, Eve was one of the select few. She died suddenly on February 20, 1998. 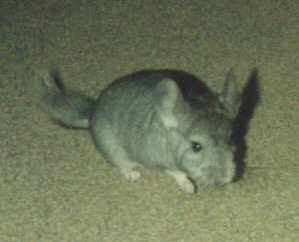 Chinchillas usually live at least until they are 15, so losing Eve at such a young age was heartbreaking. It was also devastating for Dweezle, who had lost a mate before, this loss made him crankie and miserable for months, we were almost afraid that he wouldn't recover from it. 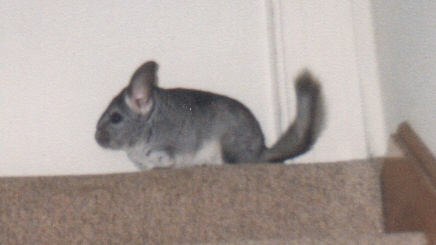 After describing the symptoms surrounding her death to a breeder I was informed that it was probably a seizure, something that is currently impossible to treat in chinchillas. 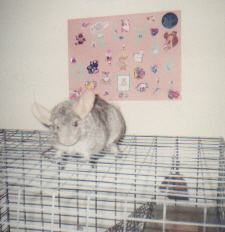 Even before Eve's death we had become notable in the local pet community for owning chinchillas and knowing a great deal about them. 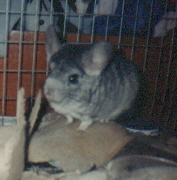 After adopting Dweezle we were approached by the pet store where I bought Eve to adopt other neglected or abused chinchillas, one of which was Wally, who became my sister Heather's pride and joy. Heather and Wally were as close as Eve and I were. Some time after Eve died I even got my courage up to purchase another chinchilla, not as a replacement of course, but as something to help fill that void that I had when Eve passed away. 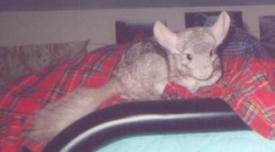 We got into contact with a breeder who lived about an hour north of us and we arranged to buy a chinchilla from her. 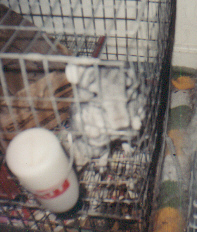 Up until that time we had only owned standard grey chinchillas, it was quite a treat to research and explore our other options! I decided on a baby female beige chinchilla that I named Merlynn. 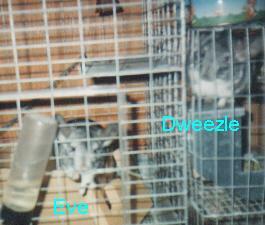 Dweezle and Merlynn didn't get along at first (she was living in Eve's old cage) but eventually he warmed up to her and they played together just as he and Eve had. 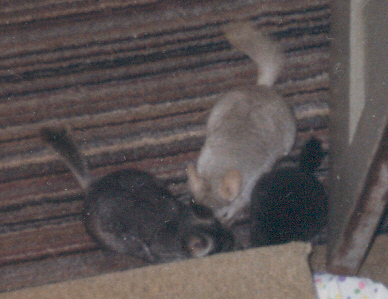 Over the next few months we adopted other chinchillas. We adopted a beautiful grey named Minnie Mouse from a family who didn't want her anymore. We bought Gypsy (named after a Mystery Science Theater 3000 character), a hetero-ebony (all black, no white belly) female. We also took in a couple more charity cases, Bubba and Chimpy, who were not regular greys, but a black velvet and a beige! 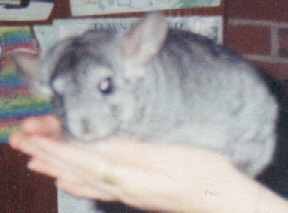 My youngest sister Annette had a grey chinchilla named Whiskerz (a friend of hers who also had chinchillas gave it to her as a gift) and my mother adopted her own baby that was named Crackers. 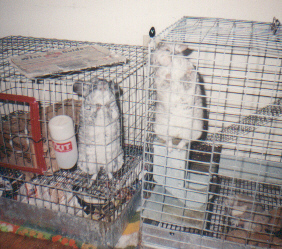 Unfortunately I decided to move out when I moved out in early 2000 I was unable to take my babies, Merlynn and Dweezle, with me. My family has been taking care of them ever since. Soon after I moved out I got news from my sister that "Bubba" had babies. Wow! 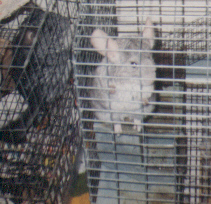 Apparently the large chinchilla "Bubba" turned out to be a female, and had been living with a male, Chimpy, for quite some time. 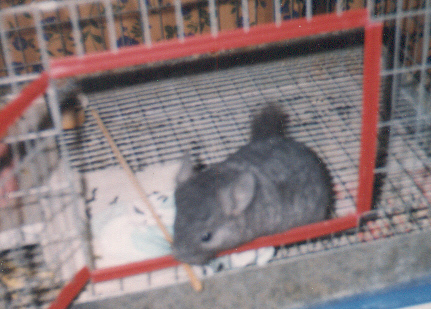 The gestation period for chinchillas is 111 days. We knew all about this because we had considered breeding some of ours in the past, so luckily my family was prepared when the new arrivals came along. 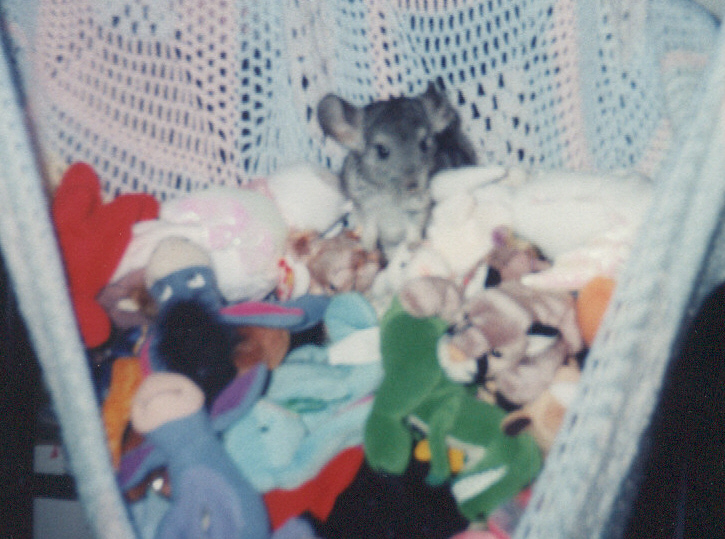 Chinchilla babies are born with all their fur, and their eyes open, unlike most other rodents. 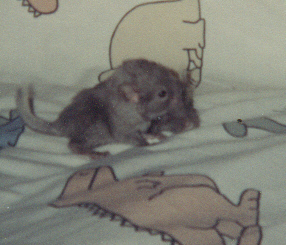 So they were beautiful little fuzzy animals even as babies! I never did get to see them in real life, but my sister Heather was fairly good at keeping me informed about them. 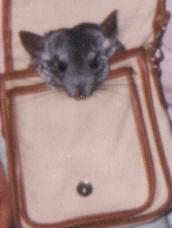 I'm not sure if I'll have more chinchillas some day, I certainly hope to, they really do make wonderful pets.